Preheat oven to 350°. Without separating rolls, cut each package of rolls in half horizontally; arrange bottom halves in a greased 13×9-in. baking pan. 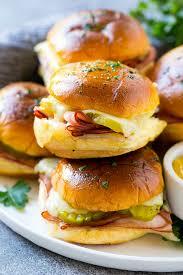 Layer with ham, cheese and pickles; replace top halves of rolls. In a microwave, melt butter; stir in onion and mustard. Drizzle over rolls. Bake, covered, 10 minutes. Uncover; bake until golden brown and heated through, 5-10 minutes longer. Hawaiian sweet rolls are tender and slightly sweet. If they’re not in your store, use egg or potato rolls, which are softer and richer than regular dinner rolls. These King’s Hawaiian ham sliders might just be the perfect party food. Find more yummy slider recipes here. 1 slider: 191 calories, 10g fat (5g saturated fat), 42mg cholesterol, 532mg sodium, 17g carbohydrate (6g sugars, 1g fiber), 10g protein.